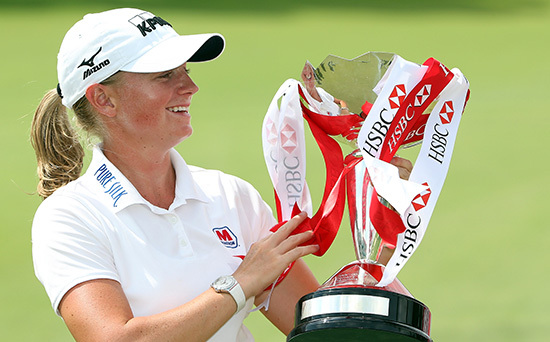 Norcross, GA – (March 5, 2013) - Mizuno Brand Ambassador Stacy Lewis captured her first LPGA victory of 2013 by one stroke on Sunday, outplaying a charging field to claim the HSBC Women’s Champions in Singapore. The highlight of her round was nearly holing out her second shot on the par-5 7th hole. Using her JPX-825 Hybrid from 200 yards out, Lewis’ shot ended up five inches from the pin, leaving a routine tap-in eagle. Displaying poise and consistent play all week, Lewis claimed her first title of the season with the help of her Mizuno JPX-825 Pro irons, MP T-11 wedges, JPX-825 hybrid and MP-650 fairway wood. Lewis built a three shot lead, but had to fend off Na Yeon Choi on the final holes to capture the championship. Lewis utilized her JPX-825 Hybrid again on 18, landing her second shot on the back of the green, giving herself a lengthy putt for eagle. 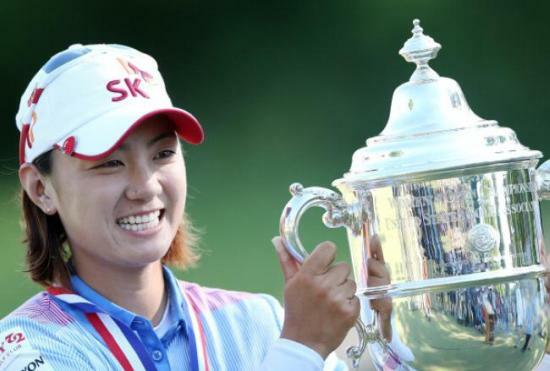 All she needed was par after Choi missed a 12-foot birdie putt that could have potentially forced a playoff. Mizuno delivers outstanding innovations and high-performance technologies for serious golfers of all skill levels. With groundbreaking design technologies and processes like Grain Flow Forging Technology, Mizuno has earned the trust of golfers at every level. For more information on Mizuno’s complete line of golf equipment, visit www.mizunogolf.com. Overland Park, KS, January 16, 2013 – Bushnell Golf, makers of the #1 Laser Rangefinder on the PGA Tour for more than a decade, continues the trend of offering Tour preferred technology for every golfer with the unveiling of the new Tour v3. Bushnell’s latest product introduces players to JOLT Technology, which allows golfers to feel their exact distance with each acquisition. The new technology, combined with new ergonomic design, will eliminate any doubt about yardages and offers the exact distance up to 1,000 yards. Continuing the trend of evolving precision through industry-leading technologies, Bushnell Golf is proud to introduce JOLT Technology in their new line of Tour v3 Laser Rangefinders. When the golfer aims the Tour v3 at the flag, JOLT Technology will provide short vibrating bursts to reinforce that Bushnell’s advanced PinSeeker technology has isolated the target and locked onto the flag. The vibrating bursts provided by JOLT Technology will now eliminate any and all doubt and assure the golfer that they have the exact distance to the flag. 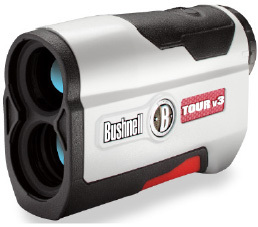 As with all Bushnell Laser Rangefinders, the Tour v3 provides instantaneous measurements in yards and meters with incredible accuracy to within inches of any target on the course. The Tour v3 boasts 5-1,000 yards ranging performance, including 300+ yards to the flag and is legal for tournament play (all Bushnell laser rangefinder models, except the Bushnell Pro 1M Slope Edition and Bushnell Tour v3 Slope Edition, are legal to use when USGA rule 14-3/.05 is in effect). The Tour v3 Slope Edition has the same features as the Tour v3, as well as the addition of Bushnell’s PGA Tour trusted Slope Technology which provides compensated distances for elevation changes. The Tour v3 and Tour v3 Slope will both be available at Bushnell retailer’s nationwide beginning in February. The retail price for the Tour v3 is $299 and Tour v3 Slope is $399. In an effort to continue its support of the Folds of Honor Foundation, a 501(c)(3) charitable organization with a mission to empower deserving military families with educational support and opportunities, Bushnell will make two new Patriot Packs available in 2013 featuring the Tour v3 and Tour v3 Slope. A percentage of every 2013 sale of the Bushnell Patriot Pack will be provided to the foundation’s fundraising efforts by. The all-new Patriot Packs come equipped with a Tour V3 (tournament or slope editions), limited edition Bushnell and Folds of Honor Foundation bag tag, new Bushnell productive carrying case and exclusive Bushnell Golf and Folds of Honor Foundation branded golf tees at a manufacturer’s suggested retail price (MSRP) of $299 (Tour v3) and $399 (Tour v3 Slope). Bushnell, the #1 choice of professional golfers, offers a full range of rangefinders, which continue to change and improve the way golfers assess distances, ultimately improving performance. Here's a fun video clip to watch on your Friday afternoon. During Golf Channel’s second round coverage of the Nedbank Golf Challenge today, cameras captured entertaining video of a baboon stealing food near the 15th green at the Gary Player Country Club in Sun City, South Africa. 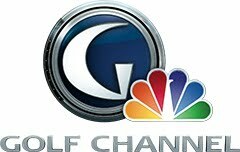 Golf Channel’s weekend coverage of the Nedbank Golf Challenge continues Saturday at 9 a.m. ET and Sunday at 7:30 a.m. ET. 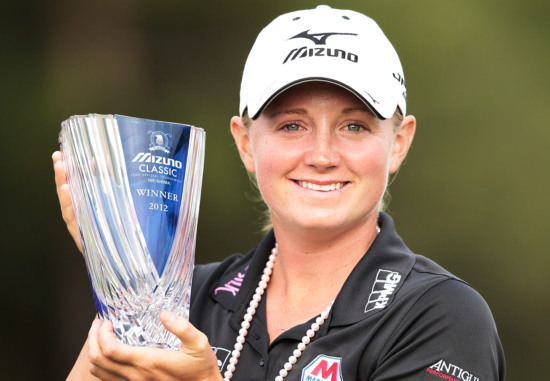 Mizuno Brand Ambassador Stacy Lewis captured her LPGA-leading fourth victory of the 2012 season by winning the Mizuno Classic at Kintetsu Kashikojima Country Club in Shima, Japan. Staking her claim atop the short list of 2012 LPGA Player of the Year contenders, Lewis shot an 11-under 205 for the 54-hole event, winning by one stroke. With this latest victory Lewis remains second on Rolex Rankings, the highest ranked American Golfer on the LPGA Tour, and looks to earn LPGA Player of the Year honors, becoming the first American to do so in 18 years. Displaying the poise and consistency she has shown all year, Lewis secured her fourth title of the season with the help of her Mizuno JPX-800 Pro irons, MP T-11 wedges, MP-650 fairway wood, JPX-825 Hybrid and JPX-800 driver. Lewis started the final round with a seven-shot deficit, but consecutive birdies on the final three holes earned her a thrilling one-shot victory. Mizuno USA, Inc. is a wholly owned subsidiary of Mizuno Corporation, one of the largest specialty sporting goods manufacturers in the world. Mizuno USA, Inc. manufactures and distributes golf, baseball, softball, running, track & field, and volleyball equipment, apparel, and footwear for North America. Mizuno USA, Inc. is based in Norcross, Georgia. Welcome to Eat Sleep Golf - The Okanagan. Have a look around as we continue to shine light on the innovation and creativity found throughout the Okanagan golf community.